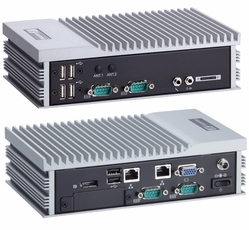 Axiomtek ultra low-power fanless embedded system with Intel Cedar Trail platform and dual display interfaces, the eBOX623-831-FL, is available now! It provides advanced graphics processing capability via the new dual core Intel Atom Cedarview processor N2600 at 1.6 GHz or D2550 1.86 GHz in 45nm technology with Intel NM10 Express chipset. This slim yet compact embedded system supports system memory of one 204-pin DDR3 800 MHz maximum up to 2 GB with N2500 and DDR3 1066/1333 MHz maximum up to 4 GB with D2550. By adopting the new Intel Cedar Trail platform, fanless eBOX623-831-FL boosts graphics performance and power efficiency. With the optimized graphics capability and dual view support (VGA and DisplayPort), the rugged unit is an ideal fit for automatic optical inspection, digital signage appliance (DSA), POS/Kiosk, embedded controller, factory automation and more applications. Management indicators Watchdog Timer - 255 levels, 1 ~ 255 sec.